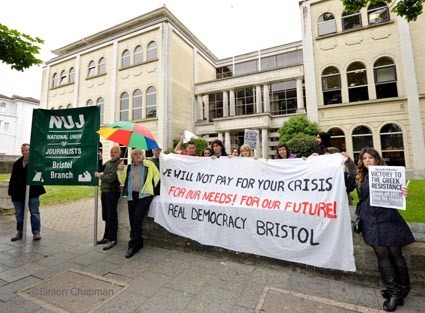 JOURNALISTS gathered outside BBC Bristol on Friday to mount a protest with members of the city’s Greek community and protest group Real Democracy Bristol against the closure of Greece’s public service broadcaster ERT. NUJ members protested around the UK last week with several demonstrations outside BBC offices against the chilling effect of the shutdown, which was made without warning. Michelle Stanistreet, the general secretary of the NUJ, said: “The shocking announcement of 2,700 job cuts and the closure of public broadcaster ERT has been roundly condemned.